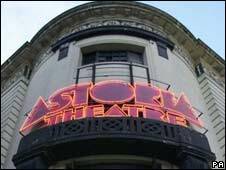 London's famous Astoria Theatre will hold a Demolition Ball later before closing its doors for good to make way for the Crossrail development. Demolition is due to begin in the coming weeks on the venue that has hosted The Rolling Stones and Nirvana. The Astoria is one of 13 buildings to be knocked down in the Tottenham Court Road area of central London. The £16bn rail development will link Maidenhead in Berkshire to Shenfield in Essex via Heathrow airport. The east-west rail route has been long promised by government and is the biggest transport project in the UK since the Channel Tunnel was built. The Astoria and the other buildings were subject to compulsory purchase orders, after MPs gave final approval for the construction in July of last year. The first trains are expected to start running in 2017, 27 years after the idea was first approved in 1990 before being shelved amid cost concerns. Building works have been under way in the busy Tottenham Court Road area for several months and when complete, the station will act as a hub for Crossrail and the London Underground. The station's ticket hall will become six times larger.